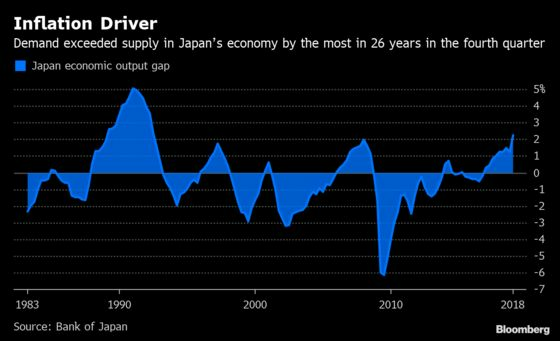 Demand exceeded supply in Japan’s economy by the most in 26 years in the fourth quarter of last year, according to a central bank gauge released on Wednesday. That’s a bit of good news for Bank of Japan Governor Haruhiko Kuroda, who has repeatedly pointed to the output gap, as the gauge is called, in expressing confidence that momentum toward the BOJ’s 2 percent inflation target remains intact. More recently, though, inflation is trending lower, registering 0.7 percent in February, as exports and growth weaken. And some economists say inflation could dip below zero this year. Meanwhile, the wisdom of the 2 percent goal is increasingly in question. In any case, Kuroda has repeatedly said it’s vital to continue the BOJ’s stimulus program, arguing that inflationary pressures will rise as long as the output gap remains positive. Today’s data indicate it’s unlikely the BOJ will consider additional stimulus in the near term, amid growing speculation that it will do so. The BOJ board holds its next policy meeting April 24-25.